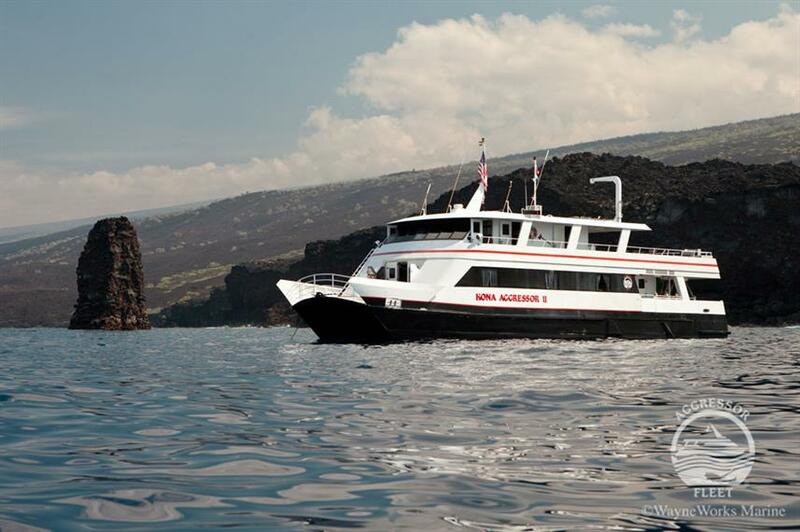 The M/V Kona Aggressor II is a 24m world class liveaboard yacht scheduling year round diving cruises along the western coast of the Big Island of Hawaii. 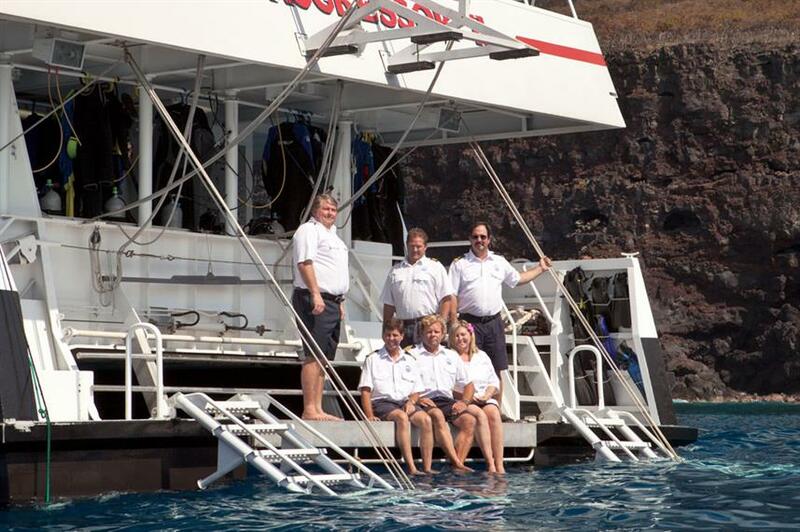 Aboard Kona Aggressor II, divers will discover a volcanic topography thriving with marine life. 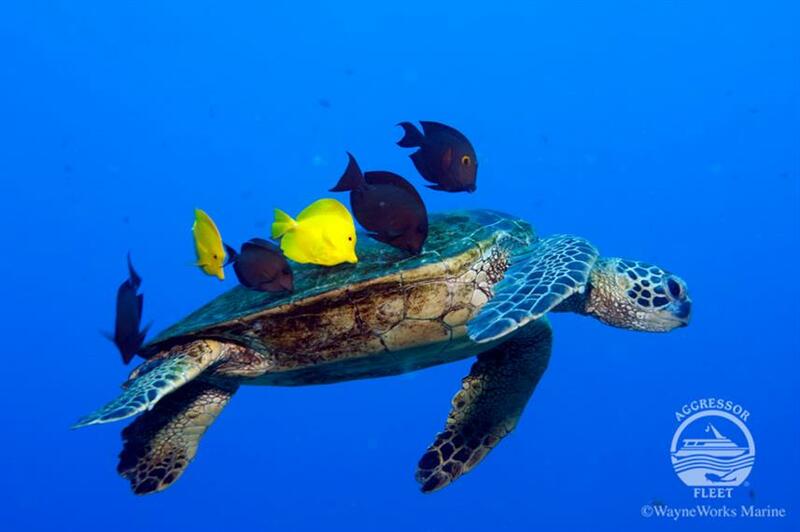 Butterfly fish, Spanish dancers, turtles, manta ray and frogfish can all be found in these rich waters. 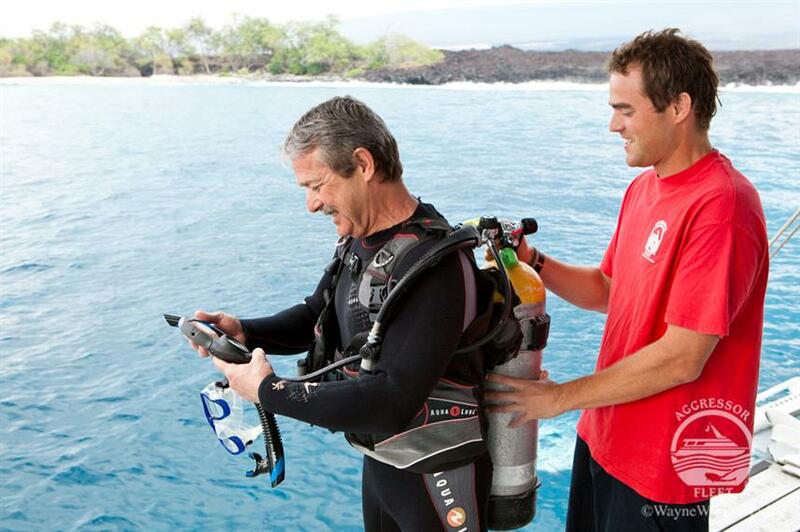 Scuba diving with the Kona Aggressor II Hawaii offers up to five action packed dives each day along with spectacular night dives. 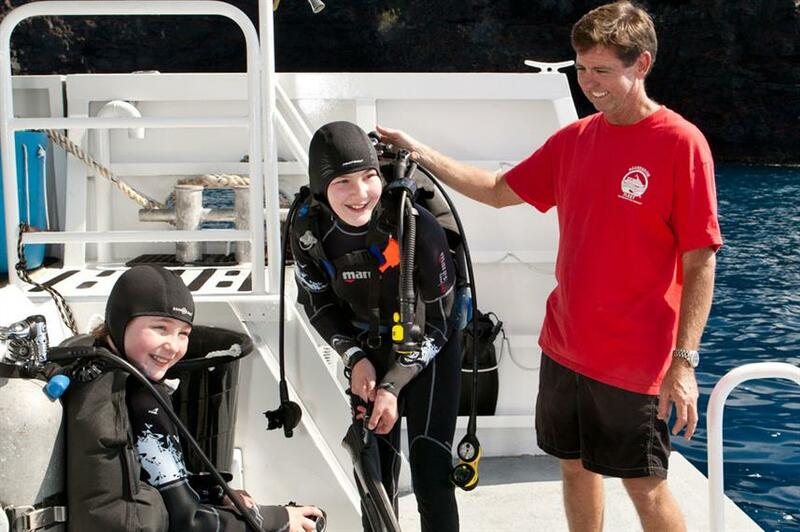 Diving amenities include a large swim platform, personal gear lockers, air/nitrox fill stations, camera table and freshwater showers. 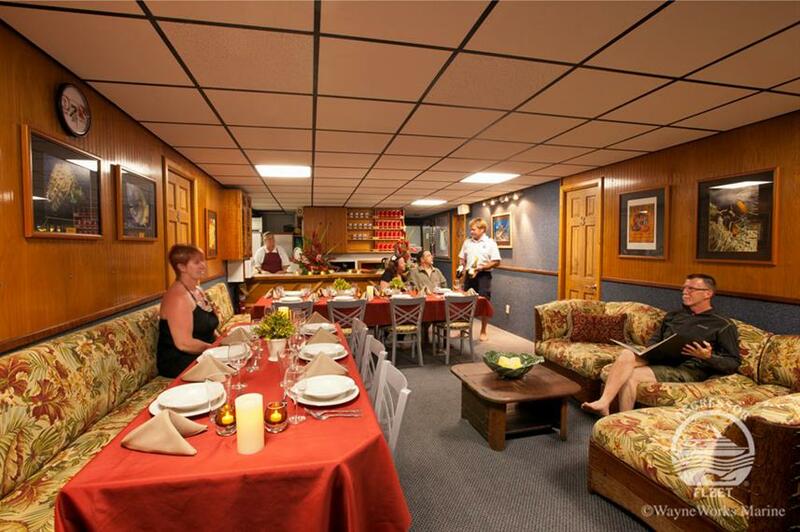 Topside, a professional and courteous crew of 6 is on hand to ensure the comfort and satisfaction of up to 14 guests. 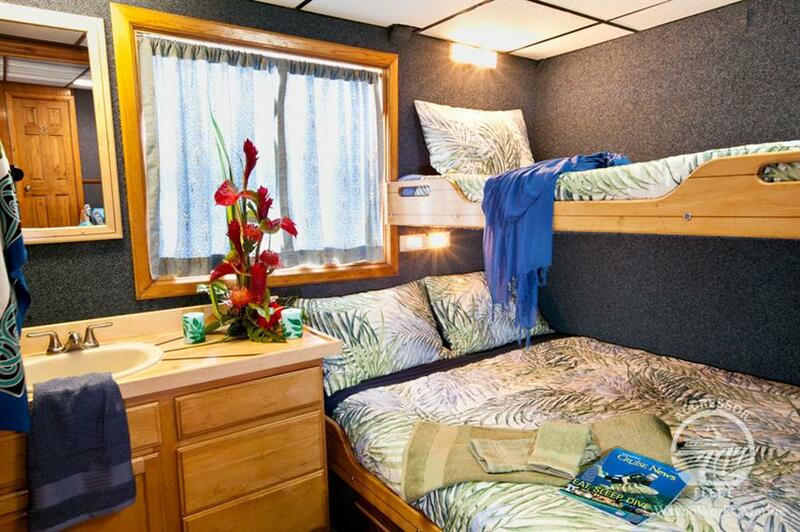 MV Kona Aggressor II has 6 luxury staterooms equipped with private bathroom and shower, storage and individual climate control. 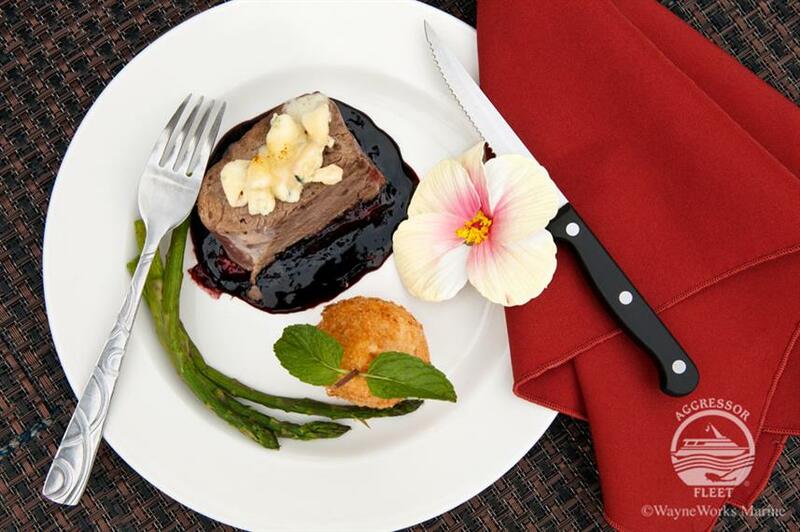 The onboard menu features a variety of American fare and local cuisine. Soft drinks, iced tea, beer, and wine are complimentary. 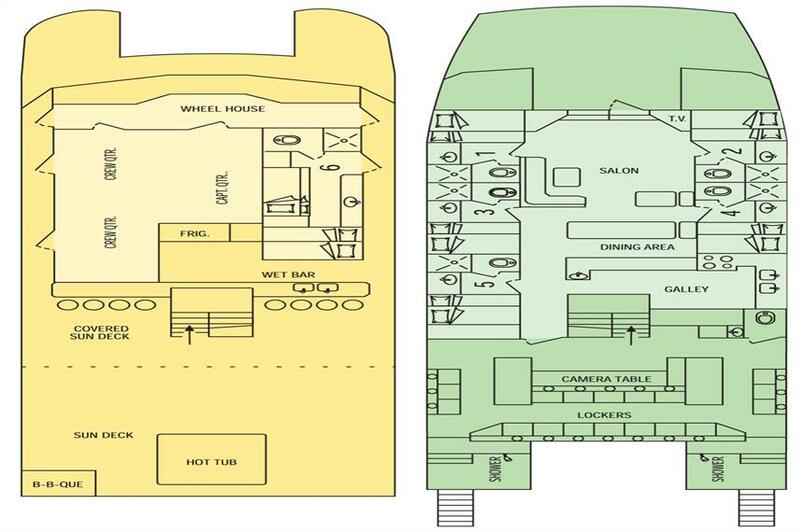 Guests can relax in the air conditioned salon and enjoy the sun deck with loungers and deck chairs, bar service and CD/stereo player. 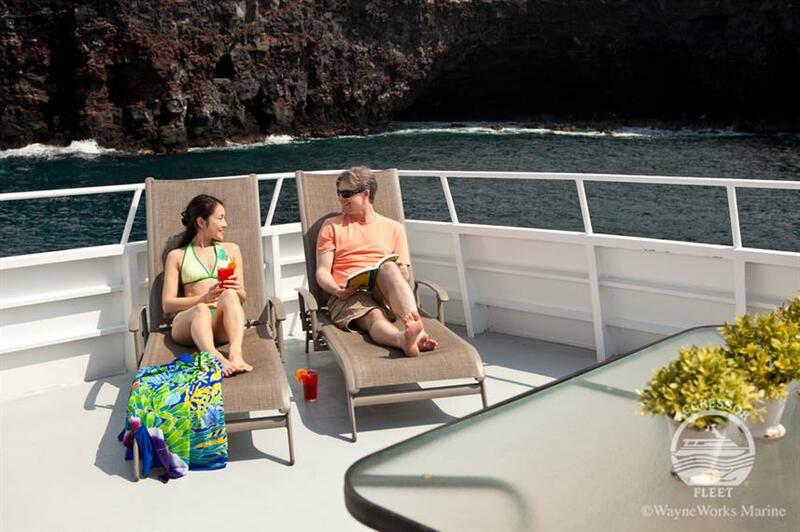 A Kona Aggressor II Hawaii diving holiday is a fantastic adventure. Book today. 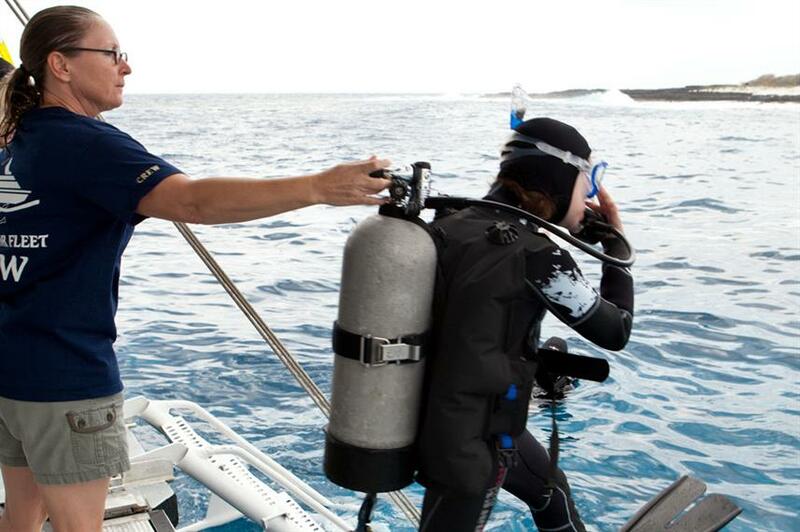 Optional Extras: Dive Insurance, Travel Insurance, Gratuities, Nitrox, Nitrox Course, Rental Gear, Scuba Diving Courses, Snorkel Gear, WiFi internet. It was a wonderful week and I felt very looked after. Being back in the water diving for the first time in 10 years. There were so many! The staff, the other divers, the dive sites, the marine life we saw! It was all great. 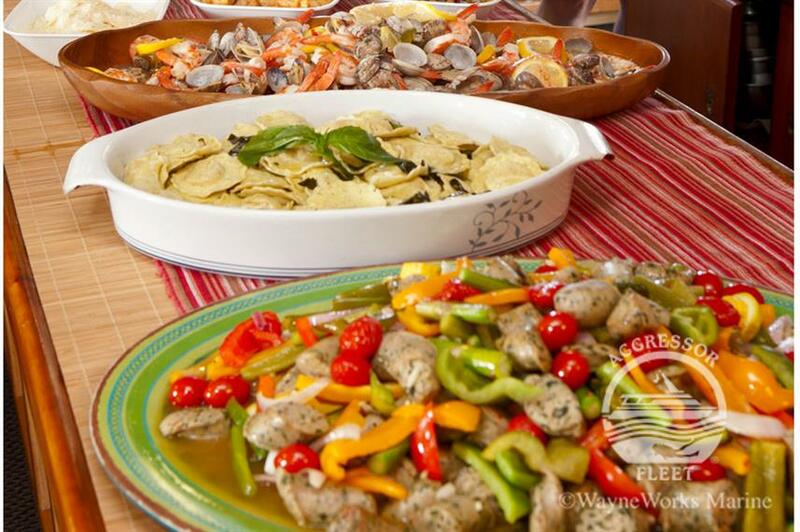 Crew, dive sites and the food. 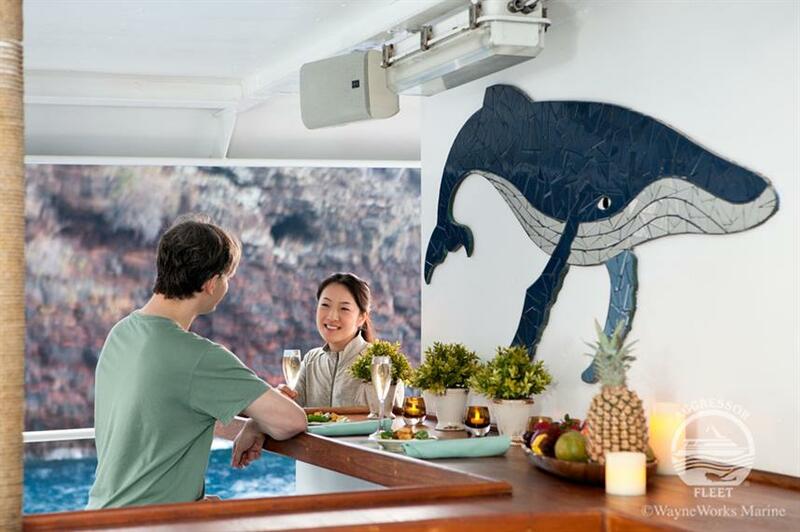 Every snack and meal was amazing, the facilities on board and the level of service of the crew were absolutely great, the divesites are good (not great though), but more than enough to explore on every dive (manta's, hammerhead, dolphins and lots of reeffish) It makes it extra special that there are many endemic species. Overall a great trip that I would highly recommend. 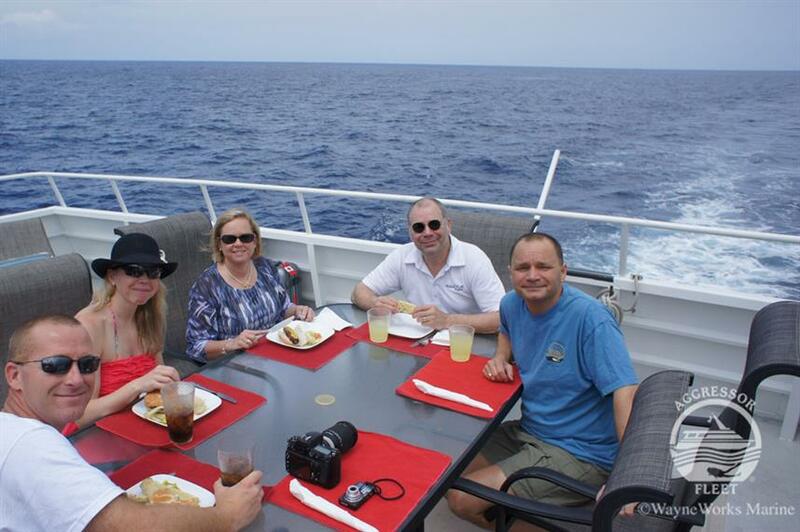 A great jam-packed fun-filled week with a great crew, great food and amazing underwater sights!. 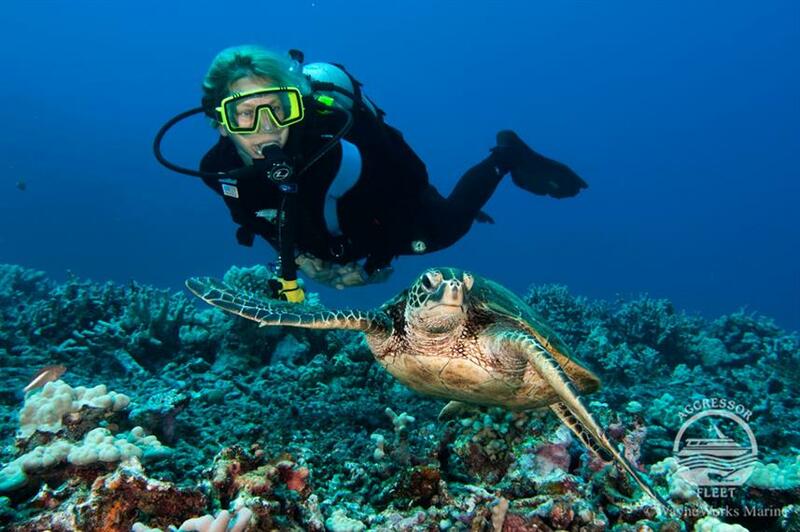 Got to dive all along the east coast of the Big Island with great food - 27 dives in only 6 days! 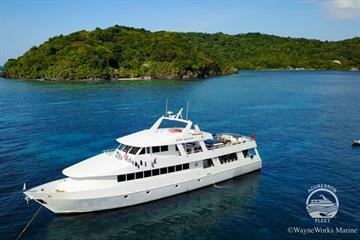 Dives included the world-renowned manta night dive and blackwater night dive as well! Seeing the sharks, dolphins and whales. 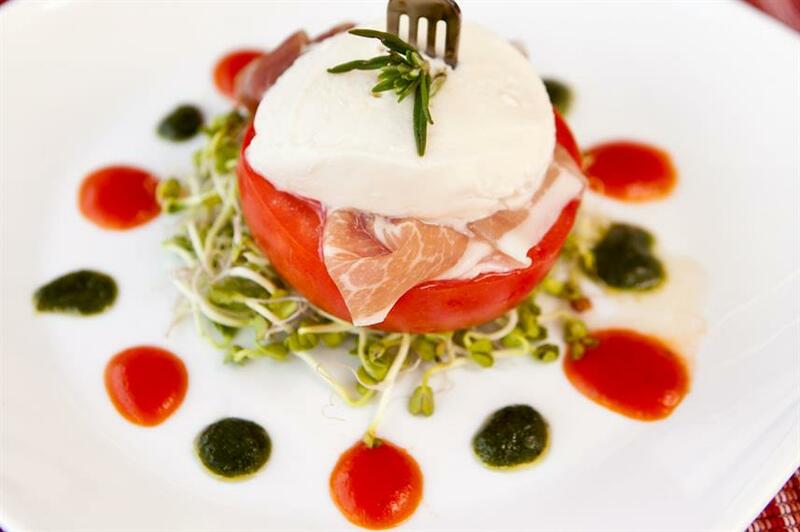 The delicious creations of Guy the cook. Friendliness and professionalism of the crew. It was an amazing liveaboard experience with a hard-working and highly professional crew who made sure that all our needs were met. Thank you, Kona Aggressor! 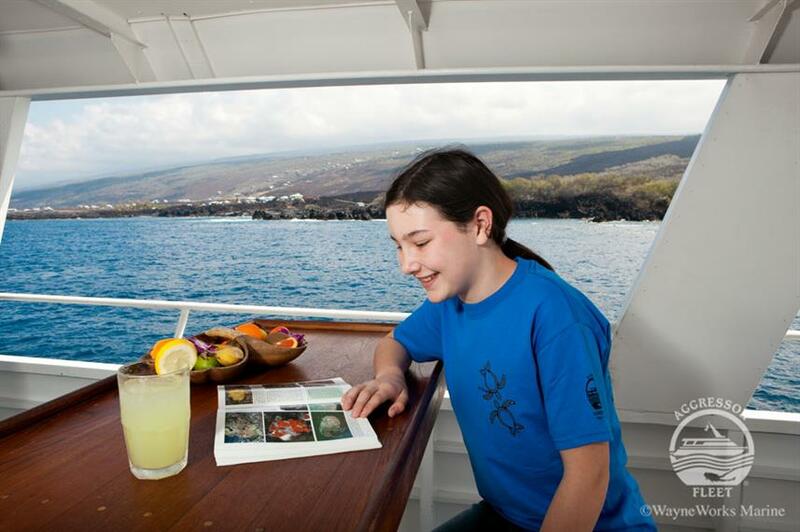 Manta ray experience, culinary masterpieces, and amazing seascapes. Diving and gear tips from Morgan, cooking by Guy, and professional guuiding on all dive sites from every single member of the crew. El buceo con Mantas estuvo increíble! Muchas gracias a toda la tripulación por el excelente servicio! The variety of fish and undersea life was amazing, and mixed in were dive experiences, as well, such as lava tubes and caves. 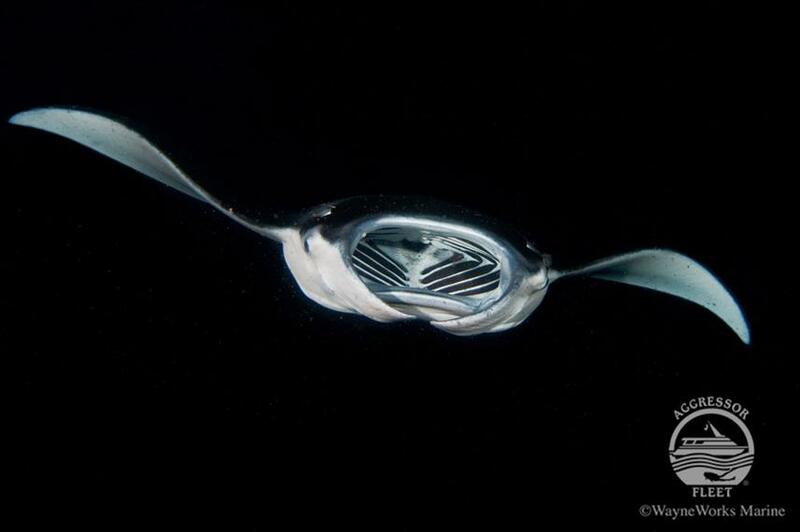 Other experiences were manta feedings and pelagic upwellings at night. 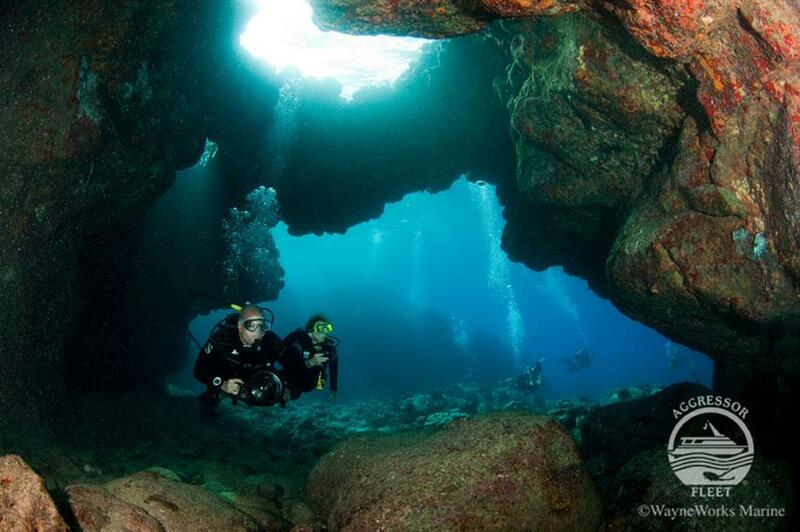 There was more than enough variations of dives and dive sights to satisfy everyone! 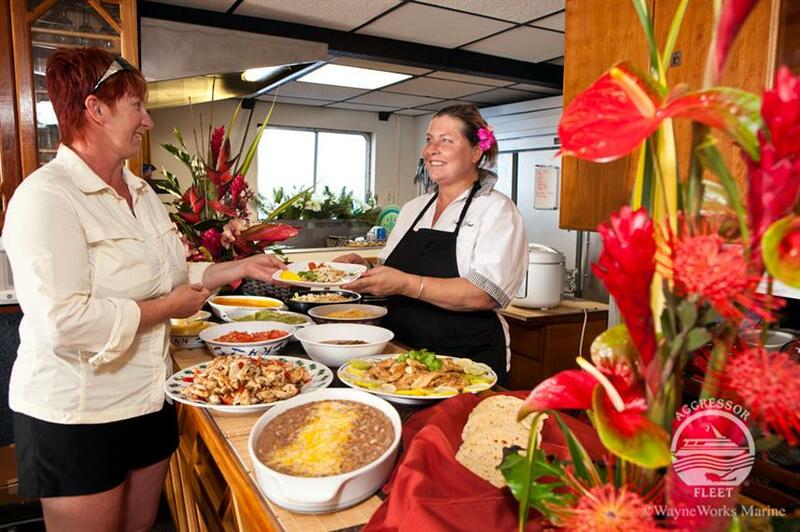 1) The crew was amazing - friendly all the time, helpful with gear, dives and information about local dive sites; 2) The food was over-the-top: breakfast made to order; fresh snacks, beautiful buffet lunch and plated dinner, all exceptional and delicious! 3) The dive sites were many and varied: some sites for fish-lovers, others for the geologic aspects, and there was never an issue of moving the boat to a new dive site if divers wanted a change. Unfortunately, due to Hurricane Lane, our trip was cut short. 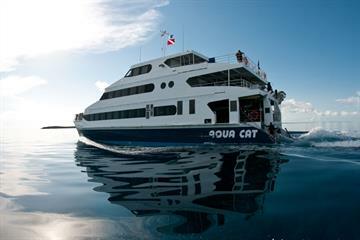 However, the days I spent at the Kona Aggressor were a great introduction to (luxury) liveaboard diving. 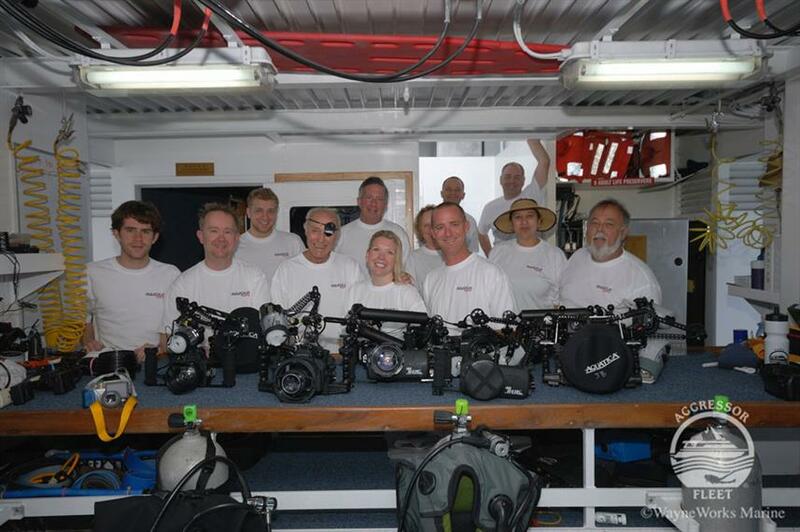 Every diving comfort was provided by the crew and the food/snacks and service were just top notch. 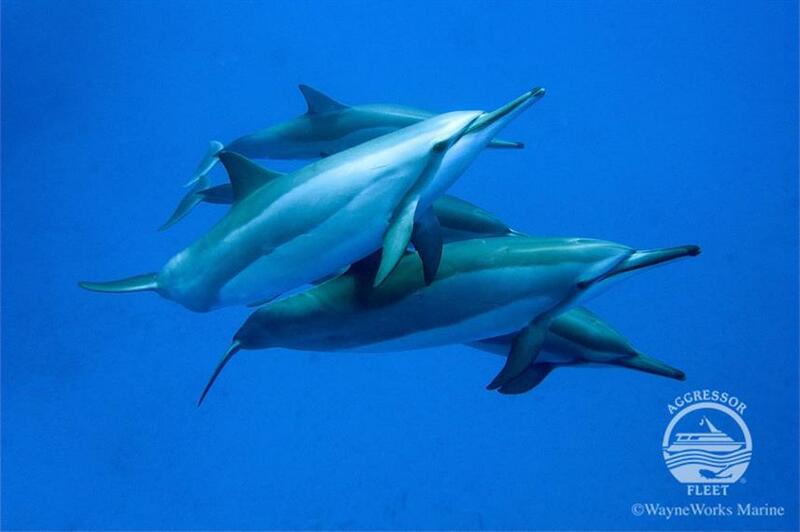 Divemasters really made sure to show us the best of Hawaii sea life. I would be willing to do Kona Aggressor again or other Aggressor boats in the future. 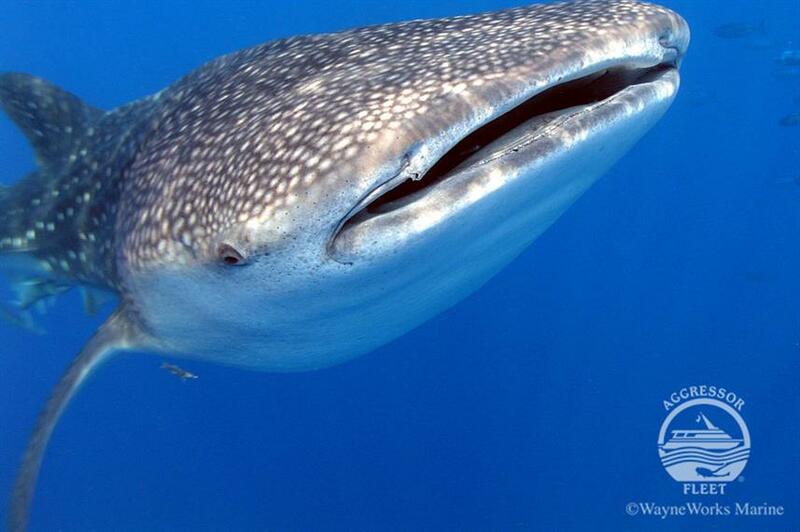 Manta Ray dive, the flourecent little animals, divng with tiger shark and octopus. The manta night dive was AMAZING! Once in a lifetime experienced! Service was excellent, the bed was super comfy, manta was amazing! The nudibranchs, the vocanic formations, the healthy reefs. The two Manta dives were nothing short of magical. Pelagic Magic was also a very unique awesome experience hanging over black water with these creatures putting on a miniature light show. 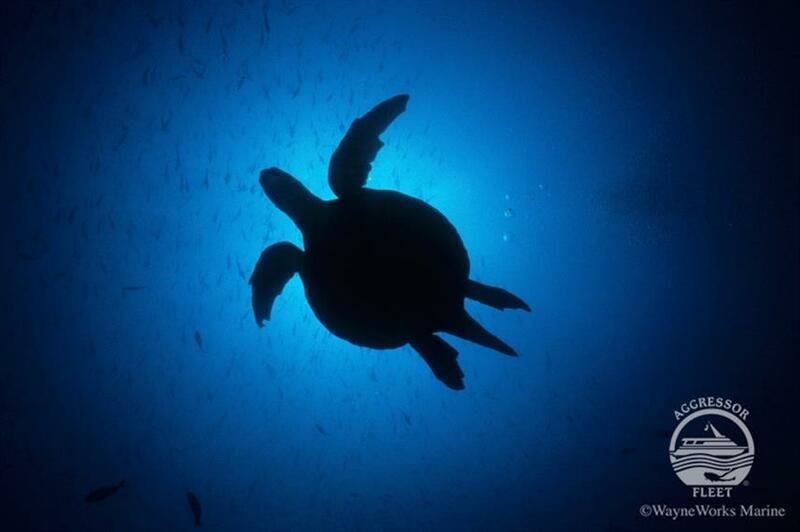 Sharks, turtles, rays, Dolphins. Everything was so much fun. The only drawback is that the rental fins have rubber foot pockets which do not accept shoes which you really need in the cold water. You better bring your own shoes/fins, one of the dive guides gave me his fins but you may not be that lucky. Other than that it was a perfect trip. Mataray Dive and the crew. They were always there and willing to help. 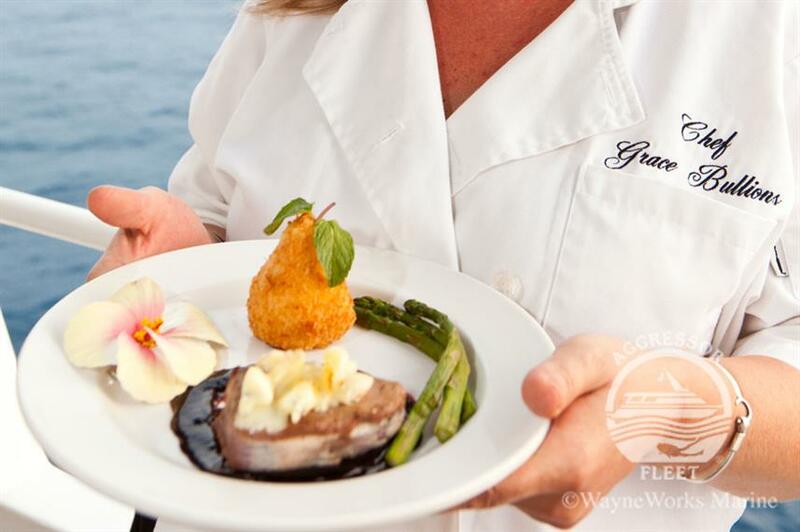 The chef was the main asset of the boat, with excellent cooking skills and great customer attention. He was also the main source of entertainment, interacting with guests during and after meal preparation. The rest of the staff was very professional and friendly, although not as engaged with guests, especially the captain. I had a great week with Colby and his crew. 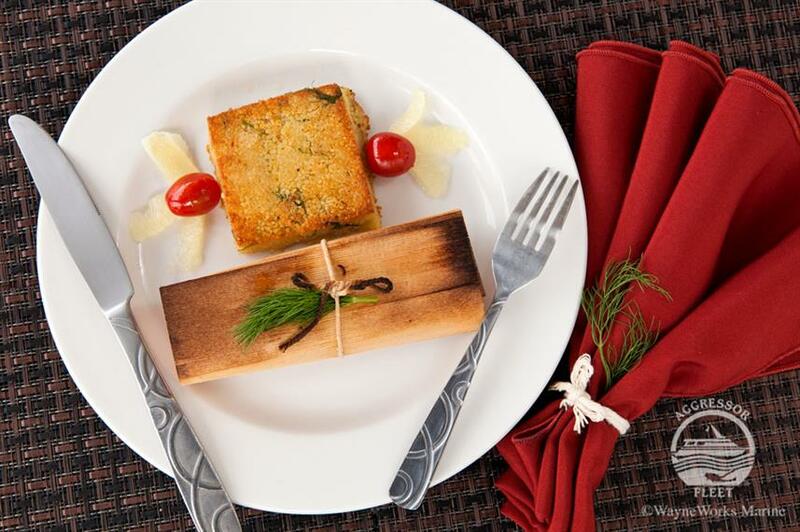 Accommodations, food (especially food), service were very good. I had a great time. My first time to Hawaii, the main draw for me was the manta rays, and wow did we see some. But the real highlight for me was when Karl stopped the boat when there were dolphins near by and I got to snorkel with them. The entire crew was super-friendly and helpful, and the food was outstanding. Compared to staying in a hotel and making day dives, this was definitely a better deal. Thanks for a great vacation! 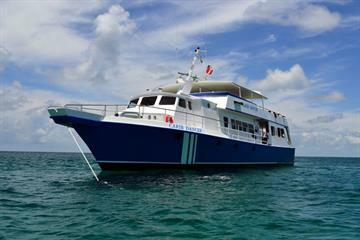 1) Divemaster tours, great for singles without a buddy on board. 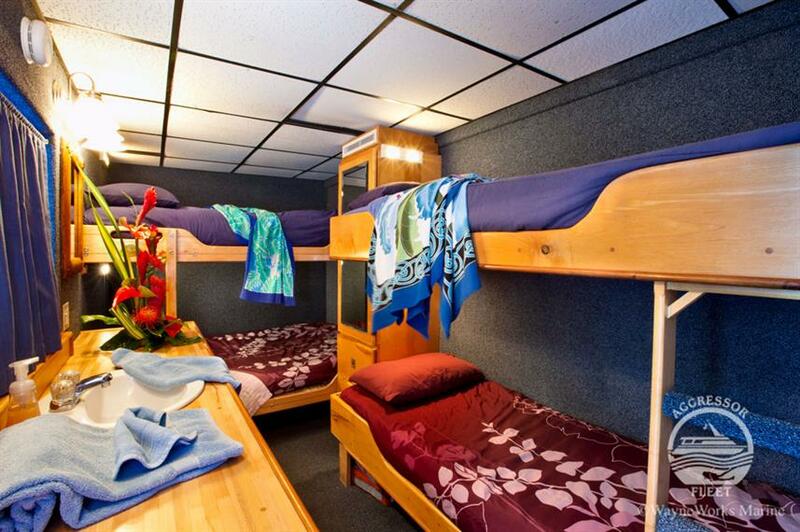 2) Cabin with shower; slept well, kept warm, and a place for my stuff. 3) Service; being catered to and helped out in every way. Excellent crew and food, the diving sites are good but the only one out of mind was the night dive with mantas.....im wonder why we did not repeat it. Please notice the last day the boat does not stay overnight at the pier, thus, if you have flight before 8 am, you have to reserve accomodation additionally on mainland. I did receive wrong confirmation from liveaboard.com stating i could stay at the boat and catch the flight at 600 am. On site, i have to run and get quickly a hotel room. That was a big stain after a 10 points trip. 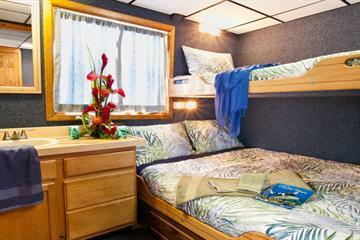 With two full-sized beds (lower) and two single beds (upper) bunk-style, private head and shower, hair dryer, individual climate control and monitor with media player. 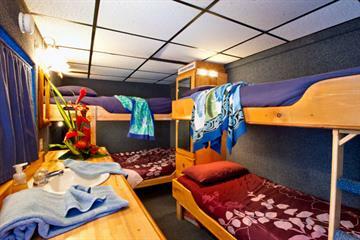 Double bed (lower) and single bed (upper) bunk-style, private head and shower, hair dryer, closet, port window, individual climate control and monitor with media player.